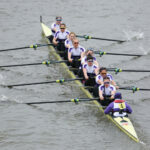 Three University of London eights have been selected to race this Saturday on the Championship Course. Following a large turnover of the Men’s squad from 2018, after a number of students graduated, seven rowers are stepping up into the UL 1st Eight and racing in white at the Head for the first time. All three UL entries are made up of Postgraduate, Undergrad and Medical students, from across the 18 universities & colleges that form the University of London. 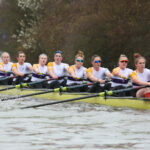 In addition there are also 12 eights racing from the University of London’s constituent colleges, with Barts & the London, King’s College London, UCL, Royal Holloway, the London School of Economics and Queen Mary all entered. Our alumni club, UL Tyrian, also race. 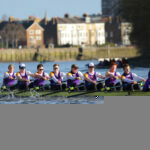 ULBC supporters will gather on the terrace at the White Hart Pub (next to Barnes Bridge) from 11:15AM. All alumni and family & friends of current athletes are invited to join. (For exact location click here). The race starts at 11:30AM.